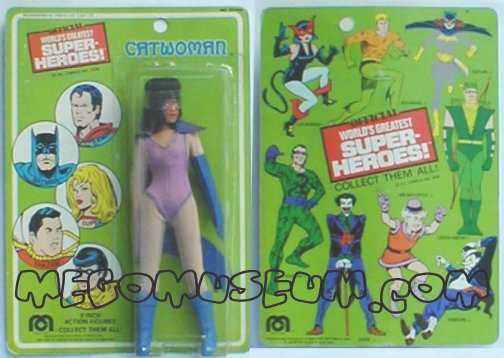 Catwoman’s popularity had risen to new heights thanks to Julie Newmar’s interpretation on the 60’s Batman television series, so it seemed a natural for Mego to add her to the 1974 Supergals lineup. The question of her being a Supergal as opposed to a Superfoe seemed to suggest that gender outweighed criminal intent. Her costume choice however is not generallly thought of as classic Catwoman attire. The “pirate outfit” as it is commonly referred to, was an early seventies attempt to change the look of the character. Catwoman only made a few appearances in this outfit before it was abandoned for a more traditional outfit but it was long enough for Mego to base the figure on this look! Learn all about the Comic Book Origins of Mego Art in the MegoLibrary. 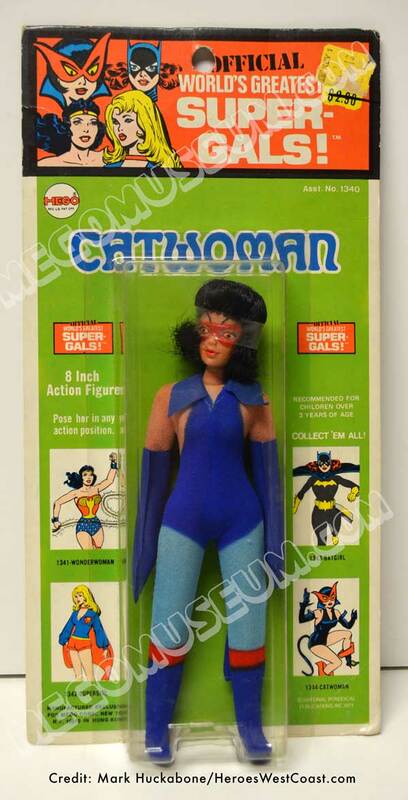 Mego Catwoman’s Hairdo seems to vary widely, from short n sassy, to curly-flippy. Those are technical terms, yes. Also, boots come in flat heels (above) and high heels (left). 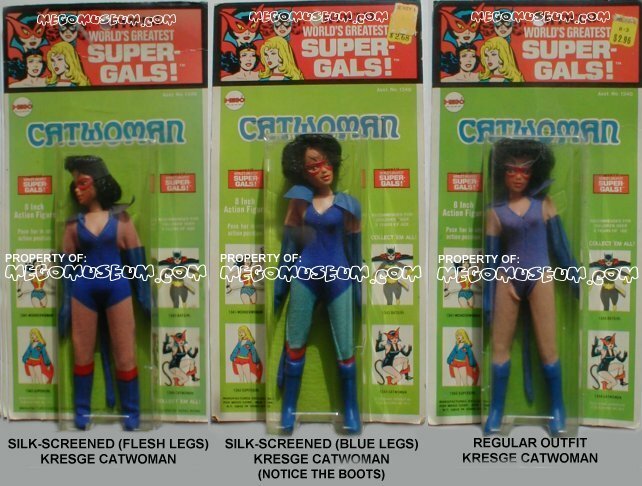 The flat version is shared with a Dinah-Mite outfit, Super Suede. 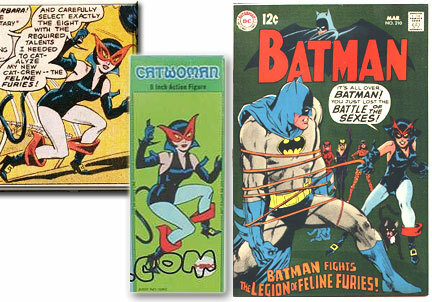 Catwoman should always have gloves, boots were not issued on early silk screeened versions but did come briefly later. A silk screened Catwoman without boots should be considered complete. 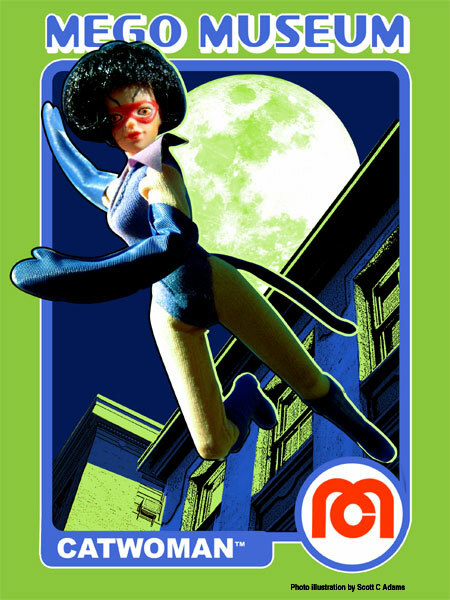 Catwoman Mego 1st Issue card with blue tights variation. 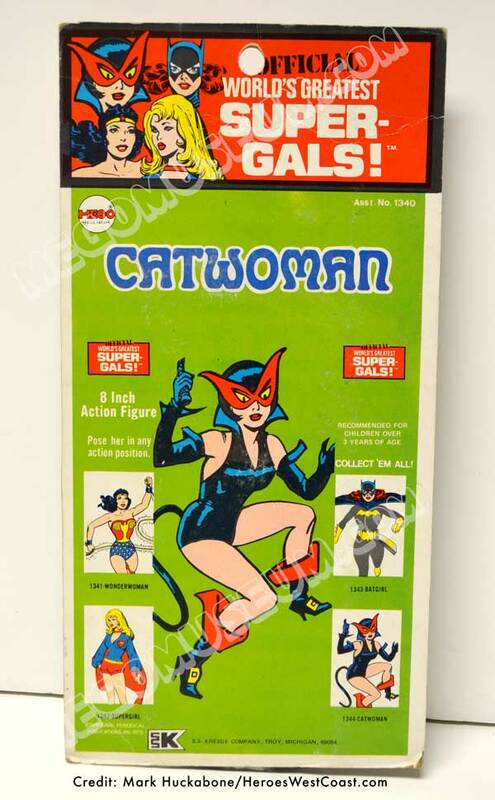 Catwoman was known as “Guatubela” in the Lili Ledy line and she difficult to find loose, forget about boxed! Pic from Foreign Mego Archive. 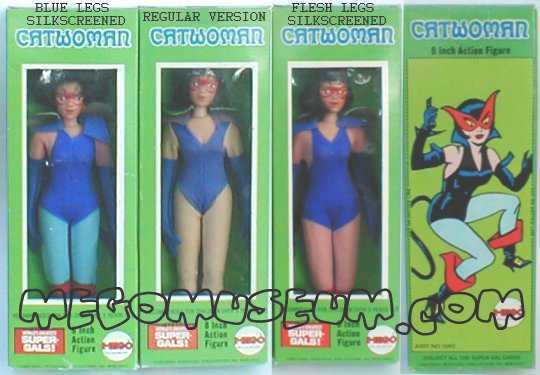 Mego included Catwoman in their Bend N Flex line in 1974 as well. Mego Museum Accessory Check: Identify original and repro parts. Both Doctor Mego and Classic TV Toys make repro gloves. 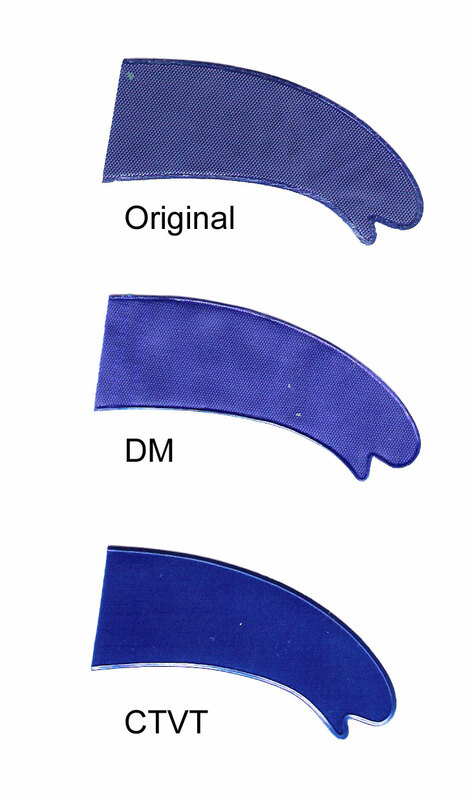 DM gloves are textured more like the originals and are marked DM on the inside cuff. CTVT’s are very slick and shiny compared to the originals and are unmarked. 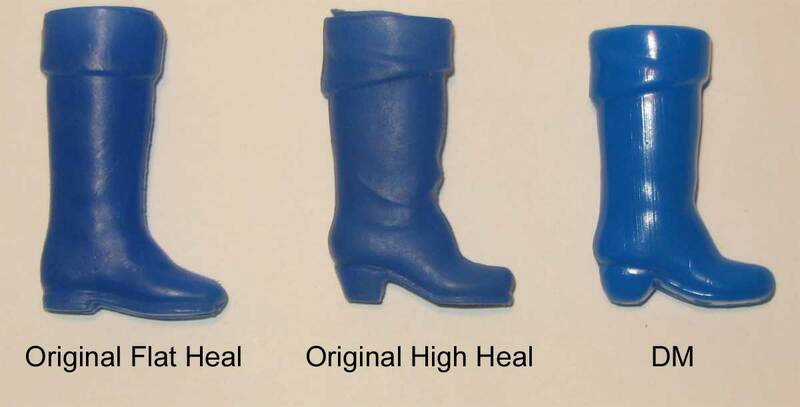 Catwoman had two styles of boots, high heal and flat heal. The high heal version has a slanted cuff. Doc Mego makes the only factory made reproduction boots for Catwoman and they are of the high heal version. The blue is a little brighter and more solid on the repros. Overall it’s also a little shorter. It is stamped DM on the bottom.